I’ve never smoked a cigarette, so it never really made sense for me to pick up vaping. After all, when vaping took off as a fad it was a bizarre bit of cyberpunk kitsch, and vapers were publicly ostracised. I ignored it, confident that the trend would soon end. Then, about two years ago, I began spotting friends and cool teens hitting the sleek little obelisks I would soon come to know as Juuls, and honestly, I felt pangs of jealousy. Sure, the company had insidiously started a “nicotine arms race” with their hyper-concentrated, addicting pods, but vaping finally looked chic, like something you’d see in Blade Runner rather than Battlefield Earth. I cursed myself for not having a nicotine addiction excuse to participate in all the festively flavored fun—which is less fun now thanks to an FDA crackdown. Fortunately, the legal cannabis market has given me the opportunity to join the cult of Juul. Though my cup already runneth over with THC and CBD vaping devices—including my primary piece from Stiiizy, which already looks like a Juul from a distance—I was nonetheless pumped when I came across the burgeoning THC Juul pod industry. Though Juul doesn’t make get-you-high pods itself, a few third-party canna-companies have wisely figured out that if they pack their oils into the pods for the most popular nicotine vaporizer on the planet, they might just pick up a few sales from those who’d rather not futz around with multiple devices. If ever I was going to live the Juul life, it would have to be now. I reached out to the first THC Juul pod manufacturer I found on Weedmaps, Kushie, and got a few flavors/strains to sample. 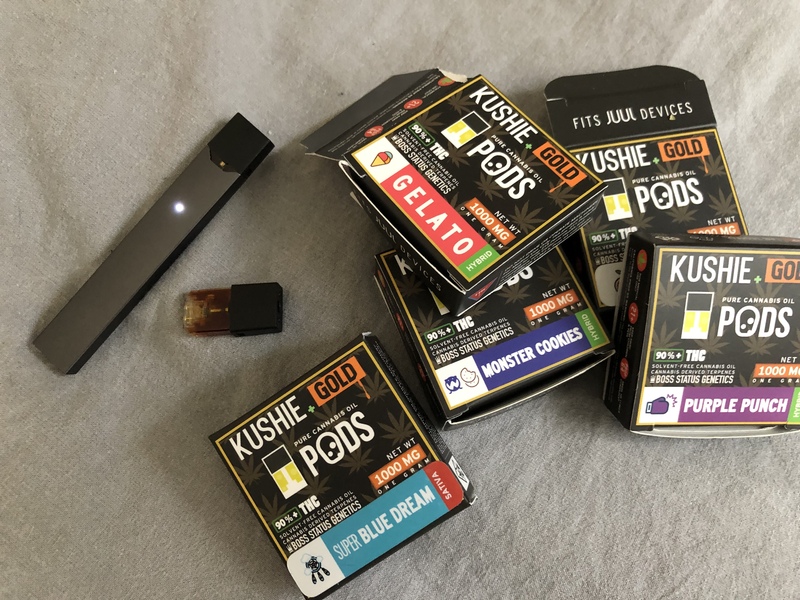 The Juul kids were apparently gaga over that now-discontinued mango flavor, and I wanted to try and approximate that with my THC test, but Kushie didn’t have that flavor available, so I opted for “gelato” to be my sickly-sweet preferred flavor. I then bought an egregiously expensive base Juul battery and got ready to rip clouds. While my new Juul charged, I pored over the manual as if it were a new iPhone. It teased exotic flavors and coached those new to vaping on how to draw, encouraging experimentation by saying, “don’t give up, you’ll find your perfect puff.” Then I noticed on the Kushie box that my strains had been developed by “Boss Status Genetics.” The weight of what I was doing suddenly hit me all at once. Was I about to tread so deep into fuckboy territory that I might never get back out? I took the booklet’s advice as I lined up my inaugural hit. I hit “play” on “Also sprach Zarathustra” and slo-mo brought the device to my lips. I inhaled. I exhaled. No vape. I inhaled deeper. I exhaled. No vape. I inhaled like I was trying to set an asthma test high score. Something lightly clicked within the pod and I felt my lungs fill with a chemical mist that I can only assume harmed them in some way. I couldn’t quite place the candy-like flavor I was tasting, but “gelato” certainly wouldn’t have been my first—or tenth—guess. Still, I attempted to commit to the flavor and closed my eyes, imagining myself on a gondola in Venice licking a cone of the stuff, while I waited for the drugs to make me high. Like with other oil vapes, Juul THC pods don’t seem to have the fast-acting punch of a bong or joint hit. Instead, the feeling is stoked slowly over session of quick draws. It took some time before I felt it, but once I did, it was as normal and pleasant as all the other THC delivery methods prevalent in my life. If you like oil vapes, Juul pods are… fine. But that was expected and ability to get high was never the crux of this test. I needed to take my Juul to the streets to see how its energy would impact my daily routine. I strolled down the sidewalk to my neighborhood 7-11, occasionally taking a puff as I walked. They don’t even know this is weed I thought of the other pedestrians I passed. Yes, recreational cannabis is legal in California, but I’d convinced myself I was somehow being subversive with this ruse. Some teens were getting let out of a magnet high school on the corner. I stopped puffing and looked around the throng to see if any were whipping out their own Juuls for an after-school fix. None were. I wondered if all these kids were merely squares or, worse, I’d missed the Juul wave entirely and was out here embarrassing myself with a passé device. At the 7-11, my fears compounded when I noticed Juuls were no longer being promoted on the checkout counter. There was a stocked bar of the devices hanging behind the cashier, but I didn’t know if that was because they were flying off the shelves or because they weren’t selling anymore. I awkwardly asked the cashier how Juul sales were going, holding up my own to clarify. She smiled uncomfortably and told me she hadn’t tried one. I left in shame rather than trying to rephrase my question. I met up with my brother to hang out that night and brought the Juul with me. He enjoys cannabis, so I offered him a hit as we settled in to eat wings and watch a show. “You smoke now?” he asked, confused. His mind was not as blown as I’d hoped. I spent the next few days messing around with my Juul, getting a moderate high here and there, when appropriate. As I failed to find cool youths to take vape breaks with and struggled with finding my “perfect puff” while my bong rolled its eyes at me in the corner, the grim reality of the situation gradually dawned on me. With one foot in the world of nicotine-addicted teens and another in the world of traditional stoners, I was essentially a man without a nation. I’ve now made peace with the fact that I’ll never know the jolt of rebellious electricity Juul’s early adopters must’ve felt. I’ll never again be on the bleeding edge of cool, and that’s something I’m gradually learning to accept. I have a few more Juul pods to get through, but when they’re done, I think I’ll retire the device and stick with traditional methods. Because when I was a child, I smoked as a child, but because I am now a man, it’s time to put away such childish things.